This Keto Almond Joy Recipe is for when you feel like a nut. If you happen to not be feeling like a nut, or are allergic to almonds, you can just leave them out and still enjoy these as a Keto version of a Mounds (or Bounty Bar depending on where you’re at in the world). 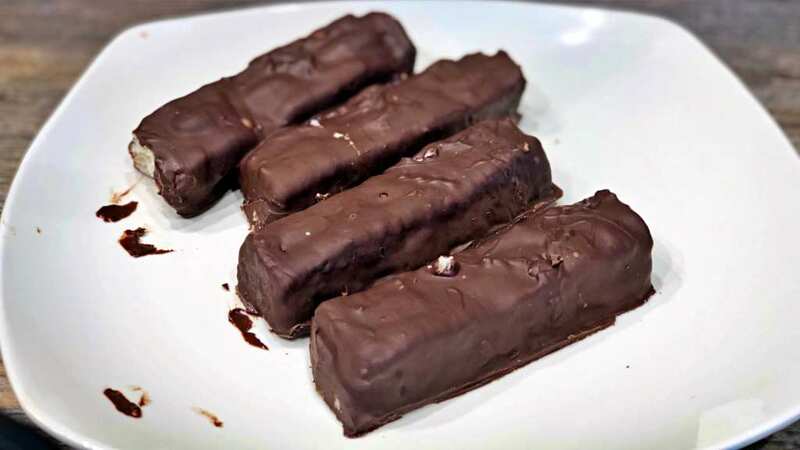 You can think of these Keto candy bars like a type of Fat Bomb or a Keto Dessert, but you know at the end of the day when your kids are asking you if they can eat one, and then you start noticing some going missing from the refrigerator, that these must taste as good as they look. Now admittedly, I am not a confectioner or whatever the profession is called where people make candy for a living, so you have to bear with me. I was powered by my will alone to make one of my favorite candies of all time into a Keto-friendly dessert that I could enjoy at home. The end result is a fabulously delicious candy bar that quite literally starts to melt in your mouth. You can store any remaining Keto Almond Joys in an air tight container in the refrigerator for up to 3 weeks, or freeze any ones that you want to save for later any further down the road than that. This modest recipe makes 14 full-size candy bars, so there will be a lot to go around. These also make a killer breakfast for when you just want to grab something from the fridge real quick on your way out the door. Using a Food Processor, or a Large Mixing Bowl and a Hand Mixer add in the Shredded Coconut, Lakanto Monkfruit Sweetener, Cream of Coconut, and Coconut Butter. Blend the ingredients together until an even consistency is formed. Line a Baking Pan with Parchment Paper, and spoon in the Coconut Filling. Press flat with your hands to spread the mixture as evenly across the pan as possible. 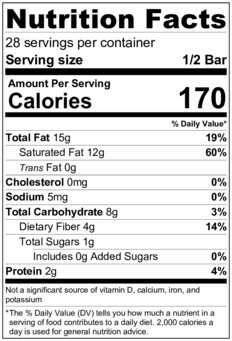 Place the desired amount of Almonds onto each candy bar. Try to visualize the size and shape of the bar in the pan while lining up your Almonds. 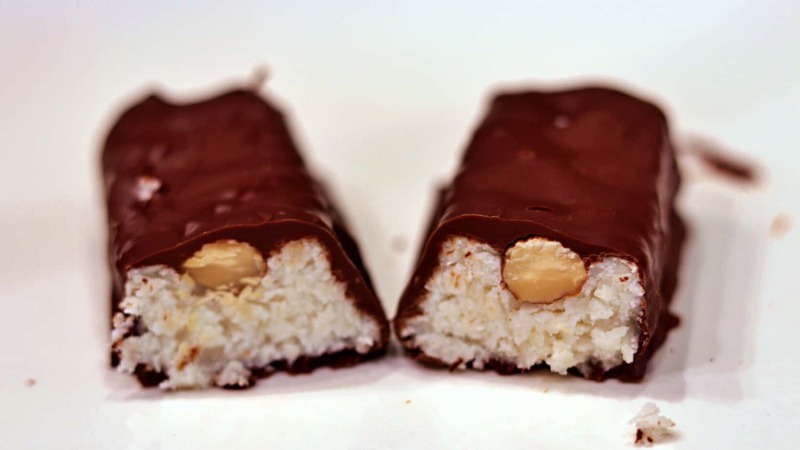 A traditional Almond Joy has 2 Almonds per bar piece, but I like to add 3 just to be a little extra. Place the Coconut Mixture into the refrigerator for about 30 minutes to firm up. After the Coconut Mixture has chilled, remove the Parchment Paper from the Baking sheet and carefully and firmly cut the bars individually. In a Medium Microwave Safe Dish pour in 12 Ounces of Lily’s Dark Chocolate Chips, and add 1 & 1/2 Tablespoons of Unrefined Coconut Oil to help it melt evenly. You can either microwave on high for 30 seconds at a time (stirring in between until fully melted) or use a double broiler setup to melt the chocolate in a bowl over boiling water. Quickly Coat the bars one by one in the chocolate and place them onto Parchment Paper to dry. After all of the bars are coated place them in the refrigerator to harden the chocolate coating even more. Be careful not to let them touch each other while they are still melted.